Some know him as Andrew while others know him as “Lord Chink”. 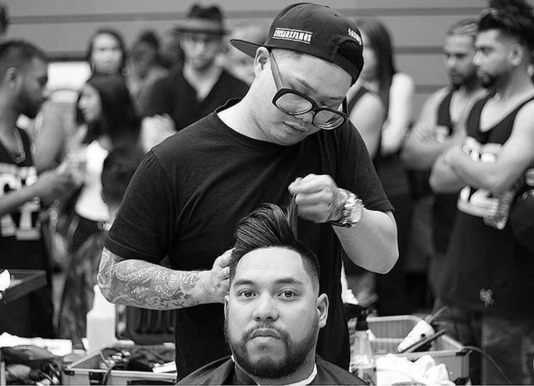 As a 2010 Graduate from the Hairstyling program at the Winnipeg campus, he is the face behind the Instagram account with 10,000+ followers, @chinkthebarber. “I’m just an everyday Barber….I’m not trying to get famous. I’m just trying to master my craft and share it with others. Just chase your dreams.” he says. Placed in the top three in ‘Trendsetter’ at the Heavy Hitters Barber Battle in Toronto. Competed in the ABA’s Battle of the Barbers and Major Fade’s Barber Battle to name a few. Today, he is a Barber at Blacklist Boutique. His career in Hairstyling started when he was going through a turning point in his life. His mentor and friend, Scott Ramos (one of Canada’s most famous barbers) introduced him to the world of fades and razor parts. “Scott Ramos introduced me to Hairstyling and I thought it looked fun…he convinced me to be a Hairstylist after seeing me at my worst” says Andrew. “Thank you [Scott] for being my inspiration, if it wasn’t for you, I’d be a deadbeat by now” he continues. He decided to enroll at MC College after our graduate, Guy Lemieux, referred him to the school. “This is embarrassing..roller sets was my favorite part…it taught me how to manipulate hair just by heat and very little products” says Andrew. What’s been your biggest eye opener since graduating? What advice would you give to MC College students?